meiadeleite.com » remember the kumquats? but this, i think, is something we don’t see in portugal (or europe) so often. they’re called pomelo, or youzi (柚子) in mandarin. in china they’re on display on every supermarket (both fresh and candied) or street fruit stand and they look like green-yellowish oversized lemons (hence their latin name, citrus maxima). 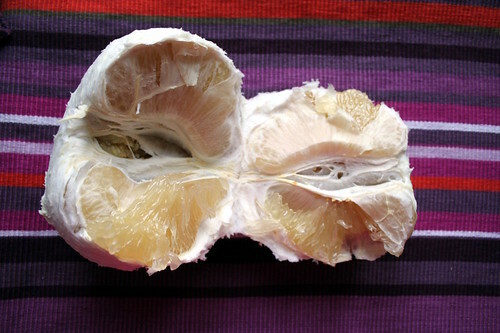 inside, there’s a really thick rind that you need to remove completely to reach the juicy pulp. they taste not as tart as lemon, and not as sweet as an orange, but with hints of both… it’s probably closer to grapefruit, now that i think about it, only sweeter. and oh-so-adictive!! give it a try if you find it around! We bought one a couple of weeks ago and just tried it yesterday! It really tastes like something between orange and lemon :-) However, I’m addicted to oranges, so the pomelo was a bit on the tart side to me. 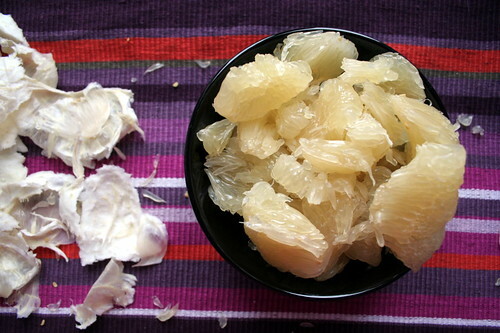 I averaged about a pomelo per day for about a month this winter. I love those things, but eating a whole one myself is almost certainly not a good idea. I endured however, until I just couldn’t stand them anymore. 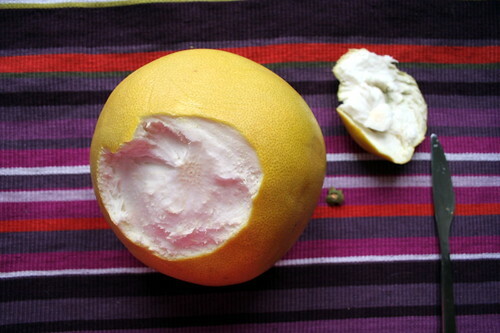 I suppose I’ll wait until next winter to lose myself once again in the pomelo.